Mary J Kudla, global humanitarian worker, was a principled force of nature of many talents and steadfast humor. Mary was a selfless front-lines advocate for people who were not in a position to help themselves; her work was often done at significant personal risk. Full of wanderlust, Mary was ever-ready to go, suitcase packed. To love Mary was to proudly watch her back as she strode courageously toward her next endeavour. She humbly served and amused others throughout her life. Early in her career as an expert in special education, she participated in a lawsuit asking the state of Minnesota to de-institutionalize housing for developmentally disabled people, and to expand group home opportunities. Victorious in the lawsuit, she was then hired by the opposing state of Minnesota to help in expanding the group home system for developmentally disabled in the state. From Minnesota, Mary moved to Washington State in 1989, where she served a term as Superintendent of the downsizing Rainier School at Buckley, WA, for developmentally disabled older adults. Life threw Mary a devastating curve-ball in her early 40s and she then spent time in the US Peace Corps in Tunisia, with family on Staten Island, NY, and travelling in Europe. After her travelling hiatus, she returned to Washington State as base in 1996. In desperate pursuit of less chair time and more active work in her early 50s, Mary trained, and became, a Park Ranger for North Cascades National Park in Washington, where she worked for four summers as a backcountry ranger. She also participated there in search and rescue, as well as in Olympic National Park, also in Washington. She was also occasionally dispatched by the National Park Service to assist in wildfire response in Okanogan County in Eastern Washington. The crown jewel of her career was as a team member of Humanitarian Support Personnel with Oxfam Great Britain (GB), where she worked for 10 years. Oxfam GB deployed her to Northern Uganda during conflict, South Sudan, Liberia, Bangladesh, Indonesia following both the 2007 Aceh Tsunami and the 2009 Sumatra Earthquake, Yemen, Gaza twice during conflict, Bihar India, Afghanistan and twice to Pakistan. She worked as a liaison between local communities and Oxfam GB management to solve challenges confronting people in poverty generally, and women in particular. Mary supervised projects related to shelter, education, health, jobs and infrastructure. 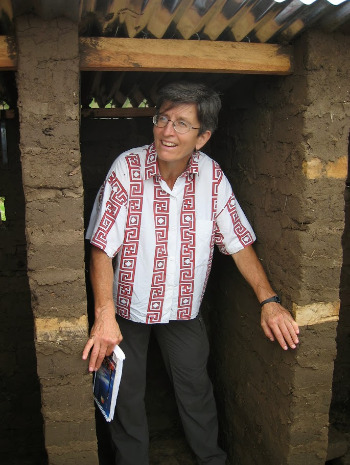 On many assignments she worked to restore local clean water supplies after disaster. Levels of responsibility for Oxfam GB ranged from Humanitarian Program Manager to Country Director. She was a proponent of microfinance programs that combine loans, grants and technical assistance to help grow local economies out of poverty. She earlier served in Liberia, Cote d’Ivoire, Guinea and Northern Uganda as a field coordinator for The International Rescue Committee. Mary volunteered extensively with the American Red Cross during the long off-seasons of her park ranger career. She served in the September 11 rescue and recovery at World Trade Center in New York City in late 2001. While in Manhattan on that response during November 2001, she was called away as a first responder to the Queens borough site of the American Airlines Flight 587 accident, the second deadliest plane crash in US history. The plane had departed JFK Airport bound for the Dominican Republic. Called to duty, Mary drove a Red Cross Emergency Response Vehicle across the closed Brooklyn Bridge to the Queens site. She served bottled water and food to emergency workers overnight, amidst plane wreckage, terrorism fears, compromised water supply and bewildered neighbors. She also served as an American Red Cross Food Coordinator in New Orleans, LA, following Hurricane Katrina flooding, helping residents with emergency aid while the city was under curfew and martial law. She was also deployed by the American Red Cross to many smaller disasters in the United States, particularly flooded areas of the rural South. Mary partook joyfully of numerous other volunteer opportunities primarily serving people living in poverty: On Staten Island she volunteered for Project Hospitality for HIV/AIDS and homelessness. In Seattle, she volunteered for Lambert House as a Board member in the late 1990s, serving LBGT youth; Compass Cascade, transitional housing for women; and Cherry Street Food Bank. In the Bellingham, WA, area, she volunteered for Opportunity Council, improving lives in Whatcom County; Bellingham Food Bank; and Helping Hands Food Bank, in Sedro Woolley, WA. Mary’s pursuit of physical fitness started when she was young at the Kudla Farm, in Mosinee, WI, where she was active in a full range of farm activities, particularly milking dairy cows. Later, during graduate school in 1978, she was a pioneering athlete in the in International Women’s Professional Boxing Association, with professional bouts in Nevada and Canada. In 1979, she earned her First Degree Black Belt from the National Karate Academy for Martial Arts. Mary had a deep love for mountain climbing developed in the late 1980s that took her to the summits of Mt Rainier and Denali, with climbing travels also to Nepal and South America. She trained with the National Outdoor Leadership School (NOLS). Mary retired from paid work in 2017, to enjoy cycling, volunteering, kayaking, hiking and birding, mostly in Bellingham. In 2017, Mary bicycled from western Canada to Ventura, CA, with WomanTours, overcoming air quality obstacles in California related to the Tubbs Fire, as they rode between Bodega Bay and Mill Valley, CA. In February 2018, she cycled solo to the top of Mt Lemmon in Tucson, AZ. Love of travel took her to about 35 countries. She also returned to her beloved Alaska many, many times for climbing, hiking, kayaking, dog sledding and sightseeing. Mary took great delight in the many treasures she found in nature: sandhill cranes, the aurora borealis, Roosevelt elk, the Methow Valley, wildflowers, the Wisconsin River, kookaburras, Mount Baker, arrowleaf balsamroot, snow geese, sea stars, mushrooms, burrowing owls, the Karakoram Highway, calypso orchids, the Great Barrier Reef, whales & dolphins, alpine glaciers, hippopotamus, fall leaves, kangaroos, rainbows, seashells, the moon, mosses & lichens, tide pools, David Attenborough, elephant seals, swans, hawks, clouds, marmots, monarch butterflies, snow leopards, seashells, spawning salmon, marbled godwits, and skunks, she loved them all. Mary earned a Bachelor of Science in Psychology in 1972 from the University of Wisconsin – Madison. She earned her Master of Science in Behavioral Disabilities in 1980 from the University of Minnesota. Mary was predeceased by her beloved Anne Kearl, of Duvall, WA, in 1991; and by her parents, Peter & Bernice Kudla, of Mosinee, WI. Mary was beloved by her partner and spouse of 22 years, Allison Beezer, of Seattle, WA. Mary also leaves behind the thousands who ever shared a laugh with her: all of her older siblings including Barb Dominowski (Mike), Mike Kudla, Joe Kudla (Karen), and Marcie Janz (Ron); nieces Rebecca Janz and Mara Anne Dominowski, nephews Tom Janz (Gaby), Dan Kudla and David Kudla (Heather); and Aunt Allison & Uncle Alan Tyree. She also leaves the extended Kudla/Beezer families, friend Gail Llewellan, the Bellingham YMCA Spin class, colleagues, service beneficiaries and friends. She was born in Wausau, WI, on January 19, 1950, was diagnosed with cancer on August 18, 2018, married Allison on September 7, 2018, and died at home of non-Hodgkin's lymphoma on December 2, 2018, in Seattle. She measured her exceptional life not by its duration, but by the average quality of her days. She was a remarkable icon along her many travels, and will be missed dearly. A Memorial will be held to remember Mary on Sunday, March 24, 2019, at 1:30pm, at the Center for Urban Horticulture, NHS Hall, in Seattle. Please come as you are. A celebration of Mary's life will take place at the family farm in Mosinee, WI, on Saturday, May 25, 2019, at 1:30pm. All are invited to spend the day. To honor Mary’s memory, please make use of your greatest gifts to protect the natural world and serve others in need. Beautiful words for such an accomplished life of wonder and service. My deepest condolences to you and the entire family, Allison. Mary volunteered at Northwest Harvest's Cherry Street Food Bank and I had the pleasure of working with her there: the world is a sadder place without her. Smart, funny, generous, energetic and with a million stories which she would occasionally tell... She had the courage to be herself and she was lovely. I have been missing her. She inspired me. Allison, I didn’t realize who Mary was to you until the end of this gorgeous tribute, but all the way through, I imagined you might have had a hand in writing it.... and I see why. Love flows from the words to the reader’s spirit. I am so sorry these months have been so torturous. I hold you in the highest regard - please know you impact my life profoundly. I guess this is a too late thank you. Mary was my cousin and unarguably one of the most significant role models and teachers of my youth. I was kind of a rotten kid and certainly a slow maturer yet Mary was always there with clear, short, and kind counsel to "grow up." I knew very little of all the amazing, humanitarian work that she accomplished in the world. A life lived large and with meaning. I suspect everyone knows what I am about to write---but in addition to the on-going kindness she showed me, Mary was fun. So very, completely, make you smile-for-a-week fun. We swam behind her horse holding the tail. We took sleds at bone-breaking speeds down Dam road . We went linear ice skating across the Eau Pleine impoundment. We always rode in the back of the pickup truck. We also slept outside---no tents. Thank you, amazing cousin. Allison please know you are part my family for keeps. What a remarkable woman. Beautifully written Allison. I'm so touched that you married. Mary was one of my all-time favorite women. I learned so much for her (although certainly had a hard time keeping up with her). I remained stunned that someone with such strength and courage is gone. She lives on in our hearts. Amazing - I had no idea...Wow - what a woman! sending love. what a life she lived! beautifully written. I especially love the paragraph of all the creatures, plants, phenomena Mary loved. I am so glad you two found each other. Being with you it was clear how much you loved each other. I am so sorry for your loss, Allison. I am so sorry for your loss. I wish you all the best. I had no idea but now have some idea of this amazing woman. I will grieve her passing. Thank you for sharing this. Mary was truly an amazing woman! Her accomplishments will have surpassed most people in every way. I remember her as a fun loving, friendly, athletic classmate who could make everyone laugh and be comfortable with who they were, or wanted to become. So it should surprise no one that she took those talents and God given direction to heart anywhere and everywhere needed. One of her biggest life lessons to each of us should be that no matter where you were born, what your parents did for a living, or what another’s expectations for you might be...GOD has other plans. We are all unique with amazing capabilities if you believe in yourself and everyone else around you. Mary did it all, no questions asked wearing her heart on her sleeve for all to see and experience! Thank you Mary for your example and dedication! No one here on earth will ever know all the lives she touched, inspiration she gave or how many circumstances she changed, but we’re all better for having her as part of our world, locally and globally. Beautiful tribute to an amazing woman. Wishing you well through this most difficult time. Allison, I have only just found this beautiful tribute to Mary. We loved meeting Mary and spending time with you and yourself. We send kiwi hugs to you dear cousin. I am so sorry to hear of Mary’s passing. I shared only six weeks with Mary on the Pacific Coast bike tour, but even during that short time, I found her inspirational. Your beautiful tribute makes clear I learned only a glimpse of her service to humanity. I was struck by her deep interest in everyone and her kindness, in addition to a great sense of humor and spirit of adventure. What an amazing woman! I know this loss is difficult to bear. You are in my thoughts. I traveled with "Trekkie" on the PCH bike trip. This is very shocking, sad news indeed. Mary was such a strong rider. It's hard to believe she was diagnosed one month before our trip. What courage she had. She was beyond friendly and I being one of the novice riders found Mary to be extremely encouraging. She pitched in and helped wherever and whenever she could. She was always the first out of the gate in the mornings and never stopped for breaks. She was super driven. The line spoken daily by near everyone was "there goes Trekkie". A beautiful, beautiful person. Wow! What woman! What a life! We shall miss her. The whole World will miss her. Compassionate, determined and capable of doing something about it all. No one will miss her so much as you do, Allison. So very sorry for your loss. You made so much possible with your steafast love. She would always have a home and you to come back to. May you continue always be a source of love and inspiration as you have to me. May Mary rest in peace. Mary was a truly amazing road warrior for peace justice and the dignity of the earth and its inhabitants. I feel honored to have had a little time with her, and recognized immediately what an amazing woman I was walking my local trail with! Much love to Allison and all whom Mary touched.